Papo, the French based model and figure manufacturer have introduced into their “Dinosaures” range two, new baby Woolly Mammoth models. These two new additions accompany the adult Woolly Mammoth figure which was introduced by the company some years ago, so collectors have the chance to build up their own Ice Age family of Woolly Mammoths. 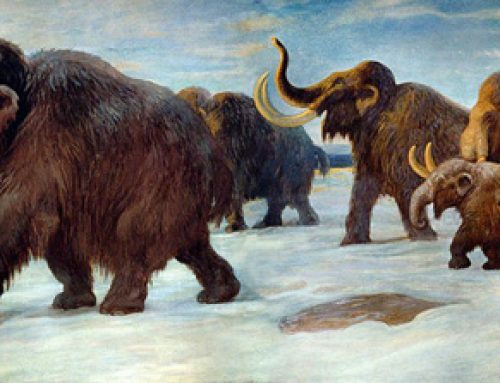 Scientists are fairly certain that just like extant species of elephant today, Woolly Mammoths travelled in extended family groups. Whether or not this group or herd of shaggy coated elephants was controlled by a dominant matriarch (female elephant), remains uncertain. As elephants today form social groups based on this structure, it may be assumed that their close relatives, the extinct Mammoths adopted similar behaviour. The two babies represent young Mammoths of different ages. The first model to be reviewed is the smallest, perhaps representing an animal just a few weeks old. This model stands six centimetres high and measures approximately seven and a half centimetres in length. It has the fine detail that one would expect of a Papo produced replica. The hairy, brown, shaggy coat is well defined and the prominent lump on the back of the animal between the shoulders can be clearly made out. Recent discoveries of very young Mammoths found in the frozen wastes of Siberia, such as “Lyuba”, the name given to the carcase of a month old baby Mammoth found almost perfectly preserved, have given scientists a tremendous insight into how Mammoth calves looked. The designers and model makers at Papo have used this new information to help guide them when creating their own baby Mammoth replica. This small Mammoth model can be posed next to the adult Mammoth replica made by this company to give the impression that the youngster is trying to suckle. The second new Mammoth model, represents an older animal, perhaps a yearling, or as colleagues at Everything Dinosaur have suggested, an animal around two years of age. This replica is much larger than the baby, measuring a total length of twelve centimetres and standing eight centimetres tall. It is still towered over by the adult Mammoth model in this range, this measures a whopping twenty-two centimetres in length, suggesting this set of replicas is in approximately 1:20 scale. The juvenile is presented in a walking pose, with its trunk held up so that the two small tusks (one on each side of the upper jaw) can be seen. Once again the painting is excellent and the detail on the coat exquisite. These prehistoric animal models are ideal for robust, creative play and it is always a pleasure to see new Ice Age models introduced, especially at a time when many manufacturers are reducing their ranges. The three Woolly Mammoth models work well together as a family group, they are going to be popular with schools who would use such replicas in teaching topics such as discussing extinction events, as well as with professional model collectors.